Nearly 630 students are eligible to collect their diplomas from Middle Georgia State University at fall graduation ceremonies scheduled for Thursday, Dec. 13. Col. Lyle K. Drew, commander, 78th Air Base Wing, Robins Air Force Base, will be the commencement speaker. The University will hold two ceremonies on December 13. The 10 a.m. ceremony is for graduates of programs in the School of Health Sciences and the School of Information Technology. 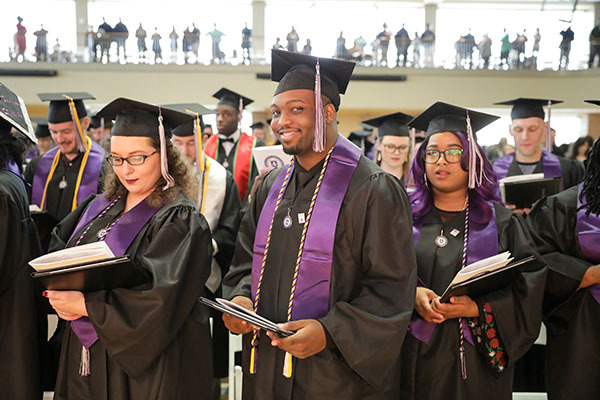 The 2 p.m. ceremony is for graduates of programs in the College of Arts and Sciences, School of Aviation, School of Business, and School of Education and Behavioral Sciences. Both ceremonies will be held at the Recreation and Wellness Center on Middle Georgia State's Macon Campus. As 78th Air Base Wing commander at Robins, Drew commands more than 2,700 personnel assigned to three groups, a communications directorate, an operations support squadron, a comptroller squadron, and 13 wing staff agencies. He is directly responsible for logistics, medical, civil engineer, security and mission support functions in addition to managing facilities and equipment valued at $8.1 billion and executing an operating budget of $170.8 million. He trains, deploys and redeploys more than 1,800 airmen annually in support of Air and Space Expeditionary Force and combatant commander requirements. Drew also serves as the installation commander supporting the Base’s 54 Mission Partners, including a major command, an air logistics complex and three wings on the 6,935-acre installation — Georgia’s largest single-site industrial complex. He is responsible for the safety, security, morale and welfare of 22,000 force airmen assigned to Robins and 28,000 local dependents and retirees. Drew was born and raised in Fairhaven, Mass. He entered the Air Force through the Reserve Officer Training Corps program at Purdue University in 1994. The student speaker for both ceremonies will be Nemiah Plant, the 2018-19 president of Middle Georgia State University’s Student Government Association. A political science major, Plant hopes to run for elected office one day or become a lobbyist. April Mouton Beal will be the alumni speaker at both ceremonies. A 2006 graduate of what is now Middle Georgia State, Beal is the vice president/chief development officer for The Methodist Home for Children & Youth in Macon. She has been with the agency for more than three years and leads the Development team through outreach and fundraising efforts, overseeing all events, marketing, donor relations, and grants initiatives. Of the 628 candidates for graduation, 420 will receive bachelor's degrees, while 32 will receive master's degrees. The rest will pick up associate's degrees or, in a few cases, certificates. The ceremonies may be viewed via live streaming at https://www.mga.edu/live/index.php. A Macon Campus map and directions are at https://www.mga.edu/about/maps.php.